The revolution in the inaugural season of Paul Taylor's American Modern Dance isn't just the presence of Shen Wei Dance and the Limon Company (performing Doris Humphrey)—it's the new use of live music for nearly every dance. And given that Taylor has favored classical music for many of his dances, it's a huge windfall. The big musical surprise was Cloven Kingdom (1976). Corelli's haughty music vies for primacy with lurking drums (by Henry Cowell and Malloy Miller, combined by John Herbert McDowell). In the prologue, the percussion is usually faint in the recording; done live, it was at first too distant to glean the sense of foreboding, but they eventually balanced out. The dancers must surely savor the immediacy of the live music after so many seasons of predictability. It can only have added nuance to their renditions. Shen Wei's Rite of Spring led off the program on Mar 17, to a recorded piano interpretation of Stravinsky's famous score. It felt very strange in the context. His style de-emphasizes emotion and human interaction, and communicates through a tightly contained expressiveness of the body and stage patternings. Drama is conjured, for example, when a cluster of dancers stands upstage at the right, and one downstage dancer faces the group, forming a line of tension. The stage floor is covered with a painted canvas of strokes and charcoal tones which resonate with the dancers' costumes; their socked feet make shushing sounds as they glide. Shen Wei's movement has moments of beauty—when a dancer swirls and twists, following organic looping shapes. But the repetition of a rapid shuffling step, arms held immobile at the side, soon takes on an annoying affectation. The cool, reserved aesthetic is so different from Taylor's that it might enlighten some viewers, but it also may distance others. Would that it were Taylor's Le Sacre du Printemps (The Rehearsal) (1980)—among his most fascinating dances. The rest of the Mar 17 program fell into the more intense, dramatic side of Taylor's oeuvre. The Word (1998) ranks among the choreographer's studies of indoctrination and rebellion. The 12 dancers wear Santo Loquasto's witty prep school uniforms of white shirts, ties, and knickers. Some of the men wear smeared-on lipstick. Jennifer Tipton's fluorescent tube installation lighting the upstage wall, covered in gray fabric, feels appropriately austere, institutional, and soulless. The commissioned score, by David Israel, is played live. The movement is strident and limbs are arranged in lines and angles; Parisa Khobdeh is the only errant dancer, in a nudie-painted unitard. As with many demons or rebels in Taylor's canon, she chassees with her arms slashing like scythes, hands, claws. Francisco Graciano is lifted and carried as being initiated or honored. Whether about religious, intellectual, or viral infection, its edges still cut. In Promethean Fire (2002), the live performance of Bach's symphony injected a clarity and immediacy into this rep staple. And for the first time since its early years in the rep, Michael Trusnovec did not dance the lead male role, now held by the warm, lyrical James Samson. To those who follow the company, it felt like the beginning of a sea change that is inevitable, even if it is simply to spread around the choice roles. Trusnovec, the paragon of Taylor's style, has danced the lead with a simmering emotional intensity that seemed to key off of the underlying terror, and redemption, that imbues the dance, made in the wake of 9/11. Samson's rendition is yet serious, but the potential for cataclysm is more remote. And while Samson has in recent years been shifting into the role of a company lead, he still has a few steps to take in order to fully assume this power. It's almost as if he wears it like a cloak, whereas Trusnovec has long since internalized it. The Mar 19 program, in which all three dances were designed by Alex Katz, led off with the whisper-light Sea Lark, which I discussed here. Last Look came next, with its frenetic, ping-ponging series of solos, the dancers' psychoses tuned to an altered state. Katz's lurid-hued satin dresses for the women were refracted off the freestanding panels—a house of mirrors capturing a moment of wild abandon. The pile of bodies at the end evokes the same image in Promethean Fire, spinning a mental connecting filament within Taylor's oeuvre. The effervescent Diggity, with its lovable field of dog cut-outs, closed the bill. The lead role was danced by Eran Bugge, whose generosity and charisma are cherished gifts. The slate on the evening of Mar 21 contained a surprise—an amended version of Death and the Damsel, just a week old. The entire final act was cut, in which Jamie Rae Walker wakes up to realize she defeated the real or imaginary demons overnight, and wipes her brow in relief (also treated in a recent post). The revised version ends as she is surrounded by the dark spirits and swallowed up. It's a more fitting ending to a work that has garnered some unintentional nervous laughter from audiences unsure of what to expect. Sunset (1983) began the evening looking splendid as always, and getting a lift from the live performance of Elgar's score. The core male duet continues to be danced by Trusnovec and Rob Kleinendorst with great sensitivity to its numerous emotional note. Aileen Roehl has distinguished herself this season, not just with her tremendous athleticism and energy (she's got the big split leap), but with her luminosity and generosity of spirit. 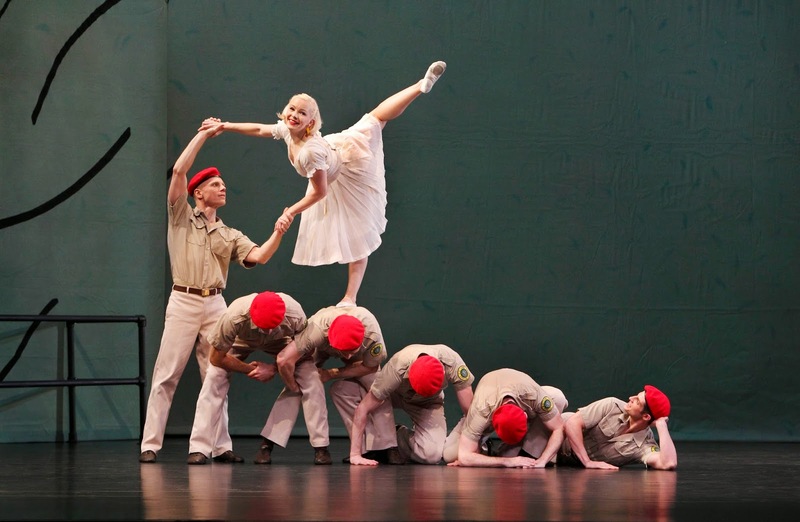 Here she takes the role of the woman whose feet never touch the ground for an extended spell, as she's continuously lifted and then steps and rolls on the men's backs. Not just a portrayal of genteel flirtations and camaraderie, Sunset is a poetic remembrance of the toll of war. The Orchestra of St. Luke's needed to tune its strings a bit more prior to Brandenburgs (1988) which closed out the bill. The opening minutes were filled with distractions, including the slightly off-key notes and the well-meaning opening curtain applause, which drowned out the early bars. But as the beautifully structured dance progressed, on through Trusnovec's series of duets with three women—Bugge, Michelle Fleet, and a vibrant Parisa Khobdeh—the strings seemed to blend better, building through the final sections when the nine dancers' swoops and leaps synced with the orchestral dynamics. As always, Trusnovec, in the male lead differentiated by his costume of olive tights, was the paragon of strength and vulnerability, precise and yet plush. Emerging into his own throughout the repertory is Michael Novak, who presents the pleasing Taylor lines with elegance and brio. The fact that Taylor was able to make a major change to the latest premiere—during the season—is somewhat astonishing, but it makes some sense given the tectonic shifts in the company's structure over the past year. The announcement that Lila York, Larry Keigwin, and Doug Elkins will be choreographing works for PTAMD is heartening, after this year's logical inclusion of Humphrey (performed by Limon) and the more artistically puzzling addition of Shen Wei. The addition of live music is obviously great, but the amount of work it entails should be acknowledged—the hours of rehearsals on the part of the orchestra, and with the dancers, all add up to an enormous artistic and financial investment, from which we viewers profit immensely. The run continues through this week.